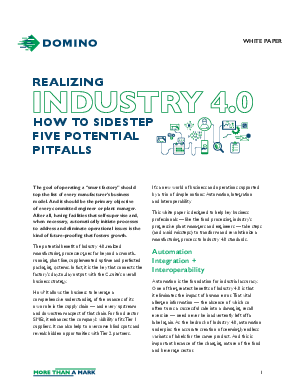 Industry 4.0 promises a whole host of benefits to food manufacturers — from reduced errors and more uptime to unprecedented visibility into operations at every step in the process. But for many food manufacturers out there, this is uncharted territory. Getting machines of various vintages connected and communicating seamlessly with each other and with existing control systems can seem like an expensive and difficult proposition. Coding and marking is a great place to start for many companies, since SKU proliferation is putting greater demands on packaging lines and introducing additional opportunities for human error. In this brief white paper, Domino examines five key issues with integrating coding and marking systems that often present challenges for food manufacturers along the road to Industry 4.0.